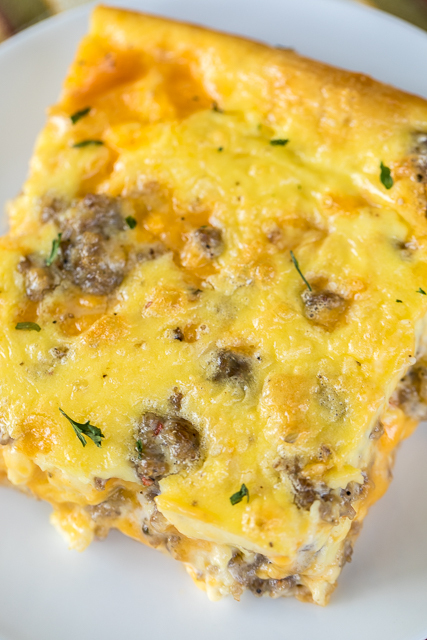 Sausage and Ranch Breakfast Casserole Recipe - CRAZY good!! Crescent rolls topped with eggs, milk, cheddar, sausage and ranch. Ready to eat in about 30 minutes. Great for potlucks, brunch, breakfast, lunch, dinner and tailgates!! Everyone RAVES about this easy breakfast casserole recipe!!! 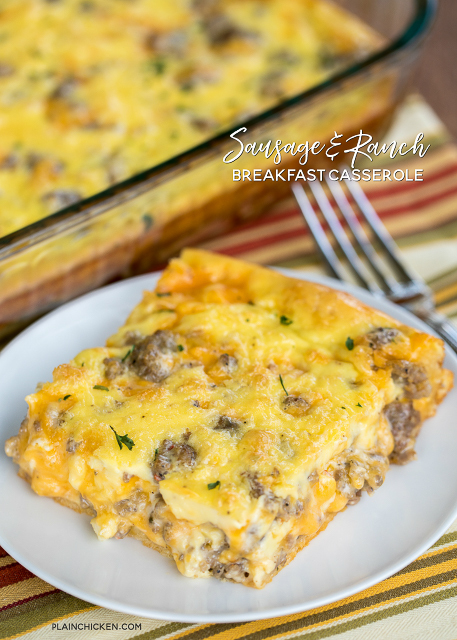 Stop what you are doing and add this Sausage and Ranch Breakfast Casserole to your weekend breakfast menu! It is CRAZY good! CRAZY good, I tell ya!!! Crescent rolls topped with sausage, ranch, eggs and cheese. I mean, how could this be bad? 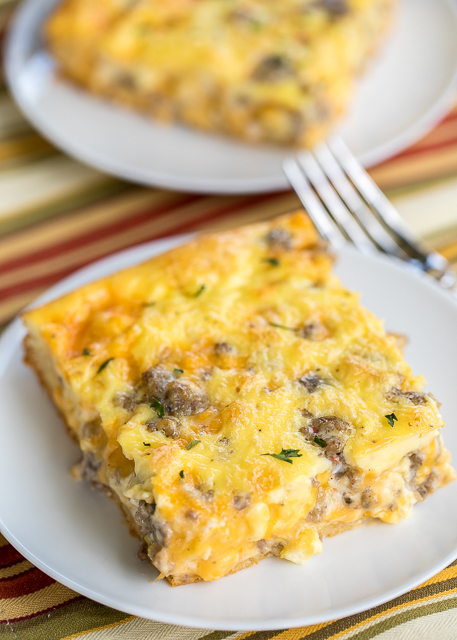 This Sausage and Ranch Breakfast Casserole is super easy to make and is ready to eat in about 30 minutes. 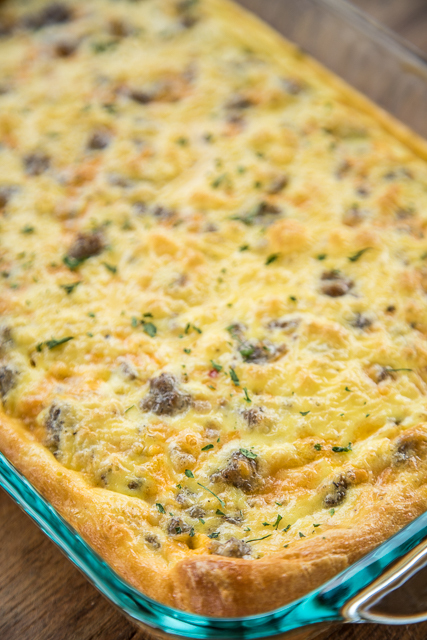 This is a great casserole for a work potluck, baby shower brunch, breakfast, lunch, dinner, or any other time you need food! Give it a try. I promise this recipe is a winner! We loved every single bite! Every-single-bite. We ate this for lunch and leftover for dinner. It was that good. I am planning on making this again over the weekend. I just can't seem to get enough of this casserole. All of my favorite flavors in one dish! Preheat oven to 350. Lightly spray a 9x13 pan with cooking spray. Unroll crescent rolls and press into the bottom of the 9x13 pan, pressing seams together to seal. Mix together cooked sausage, Ranch dressing and 1 cup shredded cheddar cheese. Spread mixture over crescent rolls. Whisk eggs, milk and pepper until well blended. Pour over sausage mixture. Top with remaining 1/2 cup of cheese. Bake 25-35 minutes or until center is set. what would be a good brand ranch dressing to use? I'm worried the bottom crust wouldn't cook properly with all the wet stuff on top. If anyone has made this please advise. Hey Laura! I've made it and the crust in not soggy at all. Trust me. I make lots of recipes and don't post any of the recipe fails. This one is a winner! Can this be prepped and refrigerated the night before and then baked in the morning? I think that would be fine. Enjoy! I made this today for a work potluck. I always bring some type of breakfast casserole. One coworker asked for one with ranch. One asked for something eggy. This was amazing. I used 7 eggs and eyeballed the milk - may have gone a tiny bit over. I made the sausage mixture the night before and assembled/baked the morning of. It took longer to bake than recipe says (about an hour last 15 with aluminum foil cover.) There was none left, and multiple coworkers said it was their favorite casserole I have brought (I have 3 or 4 go to's.) This is my favorite of all of them.... and I hate sausage. Kudos to the chef!